Bierstadt's reputation was firmly established in the early 1860s through paintings celebrating natural wonders of the American West that expeditions had begun to survey only a decade before. The grandeur of the Rockies and the Sierra Nevadas, acclaimed in newspapers and popular literature back East, aroused national pride in these newfound natural splendors rivaling Europe's great Alps in the public's imagination. 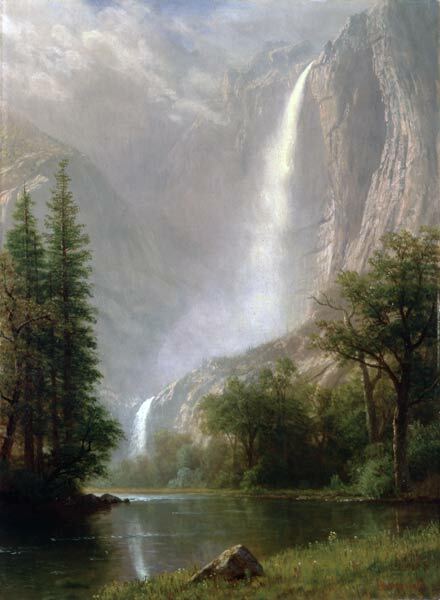 During his second trip west in 1863, Bierstadt visited Yosemite Valley, making oil sketches and drawings that would serve as studies for finished paintings he would compose in his New York studio. In contrast to canvases that suggest the expansiveness of the western landscape in monumental scale, the Museum's painting of Yosemite Falls is modest in its dimensions. Dramatic interest is created through the interplay of atmospheric affects: the spray from the falls above and the glassy reflections in the still water below.